A while back I went to a local brewery with a couple of colleagues where they served locally baked soft pretzels with banana pepper mustard for dipping. Let me tell you, I couldn't get enough of the mustard. It was tangy, sweet, a teeny bit hot and completely addictive. As I was stuffing my face with bites of pretzels dripping with mustard, I asked my friend if they sold it and he told me I should be able to make it. A few days later, a recipe for hot pepper mustard landed in my inbox and it was the base for this recipe. This was so easy. Basically just boil your ingredients, let the mixture cool and then mix in a slurry of flour and water to thicken the whole thing up. I would recommend adding the flour mixture while the mustard is still hot to avoid lumps. I didn't do this and had some lumps but I was able to whisk them out pretty easily. This golden yellow treat is perfect to serve alongside a big bowl of pretzels for the Super Bowl, or any other TV watching that requires snacks. I placed it in cute little jars and gave some away for Christmas gifts. I can't wait until summer to smear it on grilled hot dogs and I imagine it would be equally fabulous on any sandwich from turkey to brats, to even burgers. Totally one of my favorite recipes recently! Remove seeds from the banana peppers and give them a rough chop. Place in a food processer and process until smooth. Pour into a large pot and stir in the mustard, sugar, honey, apple cider vinegar, and salt. Bring the mixture to a boil and boil until it is boiling so hard you can't stir it down. Turn off the heat and allow the mustard to cool. Stir together the flour and water until smooth. Add the flour/water mixture to the mustard and whisk to combine. Turn the heat back and bring to a boil to thicken the mixture. Remove from heat, cool, and then place in sterilized jars if you are not going to use right away. If canning, process in a boiling water bath for 5 to 10 minutes. This is really interesting. Sounds good and I have been craving a hot dog lately. Sounds delicious! So glad I found your site. This sounds so different but delicious!! 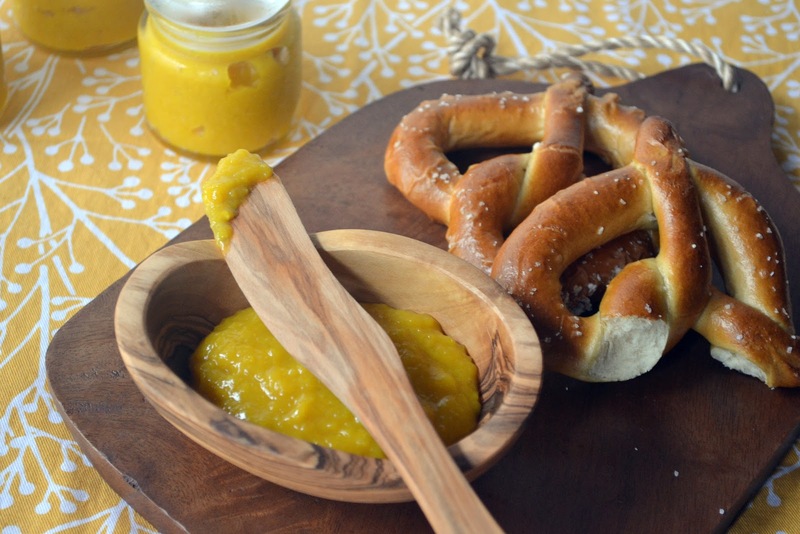 I love soft pretzels, and this mustard would be great on a homemade corn dog, too! I just made this recipe and it is absolutely delicious! It went a long way, too. I'll give a jar to each of the two co-workers who gave me the banana peppers in the first place. YUM! I just finished making this and it is delicious. I only made half the recipe because I wanted to try it first and now I wish I would have made a double recipe of it.